Your right hand is the engine of your ‘ukulele and strumming is often the throttle. Learning how to properly power the strings will take you a long ways towards ‘ukulele proficiency. With only a couple ‘ukulele strumming patterns and a little feel you can play most songs convincingly. The fancy stuff can wait. To start out on the right foot, make sure you can nail these down and up motions. Hold your strumming hand in a “pistol” shape (like you were a kid pretending to shoot somebody) and “let the air out of it” so that your index finger curls in to a loose 90 degree angle to the rest of your hand and the thumb rests (lightly) on the index finger’s 1st knuckle. This is the default ‘ukulele strumming position. Brush across all the strings in a downwards motion with your index finger. Twist your wrist downwards a bit so that your finger hits the strings at an angle. This helps avoid jamming your fingers in between the strings. You can also relax your strumming finger so that it bounces over each string like a spring. The best place to start strumming the strings is close to where the neck meets the body of the ‘ukulele. This is where the best tone is produced and where the string gives your finger the least amount of resistance. Strumming in other places will yield different sounds and should be experimented with, but take it one step at a time and start where it’s easy. Try playing some downstrums on your ‘ukulele to a rhythm: 1…2…3…4… This will be a simple down, down, down, down strumming pattern. Consistency is the key. Practice this until you feel comfortable. The next step is to add an upstrum in between each down strum, but to start let’s just focus on the upstrum. Simply reverse the motions of the downstrum and drag your index finger back up the way it came. Again, you can twist your wrist and let your finger loosen up a bit too easily cross the strings. Practice this motion on its own, just strumming up while counting. Once down and up are simple on their own, combine both motions and strum down, then up. In between each strum you’ll have to change the angle of your wrist and index finger. Always angle your finger so that it bounces across the strings going both directions. For reasons that are beyond me, many people naturally gravitate towards strumming everything with their thumb. This is fine. There’s not really anything “wrong” about it and some songs can benefit from the mellow sound of a simple thumb downstroke. However, I tend to encourage people away from this way of strumming simply because it’s not a very expandable motion – the way the thumb hits the strings limits your options for chunking, and different tones. Like most things on ‘ukulele, you’ve got to be patient with your strumming progress and not go racing ahead. Spend a couple weeks just strumming down/up until it’s very natural. Learn a couple simple songs and focus on getting the strumming as smooth as possible. As you “chalangalang” (a fancy name for a swinging down/up strum), you’ll be developing muscle memory that will be vitally useful for other strum patterns. When you strum down and up you are creating a rhythm. If you examine the rhythm you’ll see that all the downstrums happen on the count: 1…2…3…4… If you only play downstrums you’re basically counting the song in quarter notes. Upstrums happen between the counts. They can also be “counted” by naming the upstrums “and” (often notated with “+”). In this way you can count: (1) and (2) and (3) and (4) and to play only the upstrums. Combine both down and up motions and you get the whole shebang: 1 + 2 + 3 + 4 +. Now we’ve divided four counts into eighth notes. Any time you play eighth notes they can have a “feel.” This falls into one of two categories: swing (also “shuffle”) or straight. Straight is the most simple to visualize: it’s completely even between two eighth notes. Both “sides” are the same duration – like the ticking of a clock or the swing of a pendulum. Swing, on the other hand, makes the notes lopsided. Loooong, short, looong, short. This gives the strum a galloping feel. Funny thing is, gravity works in favor of a swing strum which is why most people naturally play ‘ukulele strumming patterns with this feel. 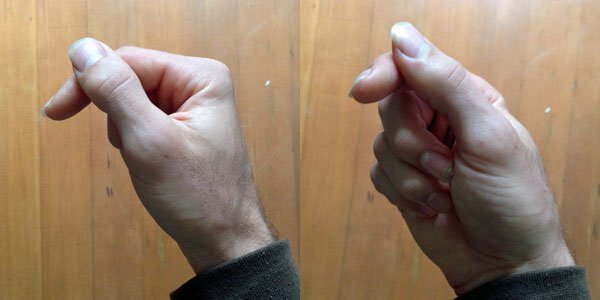 Your hand drops easily with gravity, but then you pull it up with effort and then let it fall again as soon as possible so you don’t have to waste any energy. This naturally creates a long, short swing feel. Learn to play both as most songs sound better with one or the other. Here’s a tutorial on some quick tricks to help improve your strumming. Once you’ve spent sufficient time practicing the basic strum, you can expand upon it by learning some different strumming patterns. These follow the same general down/up motions, just in different orders and timings. There are only a few core strumming patterns before you break into more complex techniques and ideas, but these here will keep your hand/mind coordination busy! This one is used in a lot of contemporary Hawaiian songs and is most people’s default “island” sounding strum. The hand motion is down, down, up, up, down. Since there are double downs and double ups, you must sometimes move in the opposite direction without strumming to get back to your starting point. This essentially makes the hand motion for this strum just a simple D/U pattern. The only difference is that you are only strumming the strings some of the time. The rest of the time you are skipping strums even though your hand is still moving. This is key: Keep your hand moving the entire way through the strum pattern! Also known as a “skank,” this reggae strum is incredibly simple to comprehend. Executing it however, is quite a trick in itself at first. The key lies in the amount of time you let your chords ring. Of all the ‘ukulele strums people want to learn, it seems the one Isreal Kamakawiwo’ole used on Somewhere Over the Rainbow/Wonderful World is on the top of the list. It’s not hard, but combines both picking and strumming to create a more hybrid pattern. This is a great example of how effective a simple ‘ukulele style can be. Pick the top (G) string with your thumb. This is where the bounce comes in. You have to move your hand up as you pick so you can be ready to play the next downstrum. Then strum down, up – down, up. There’s a hesitation between the down, ups. Pick, down, up, down, up. Don’t make it more complicated than it needs to be! As long as you get the bounce in your pick, you’ll be fine. The chords for the intro are: C Em Am F. Apply the above strum to them and you should be well on your way. IZ plays with a low-G string on his ‘ukulele so if your “pick” sounds too high, that might be the reason. Since I keep a simple approach to strumming I’ll let others create huge libraries of strum patterns and just link to their great work. Al Wood over at Uke Hunt has put together some great audio examples of his top uke strumming patterns. Ukulele Go has an even larger selection with 32 patterns and a video demoing each one. As long as you can count, you can figure these out. But please remember that at the end of the day, knowing 100 strumming patterns doesn’t mean jack if you can’t apply them well in a musical way. So pick a few favorite strums and learn to use them well in your favorite songs. I’ve spent a lot of years as a teacher beating my head against a wall and wondering how to present strumming to students. They always want more, more, more strums and I want to teach less, less, less strums. Because they (with a small handful of exceptions over the years) loose the rhythm as soon as they start to think about the new strum. If you lose the rhythm to gain a strum, what’s the point? This is very frustrating for me as it often doesn’t improve very much with a lesson (or several) worth of practice. When this happens I don’t feel like I’ve helped them play better music. I’ve simply given them a distraction. Fortunately, over years of thinking about this, I’ve made a few useful connections in my mind. 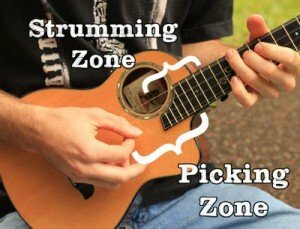 Why do beginners loose the groove when learning strums? Because they go almost instantly from thinking about the music to thinking about the motion. Problem is, they don’t KNOW the motion. And often just resort to guessing as best they can. This manifests as jerky, robotic rhythm and unnatural hand movements. Which sometimes work, but mostly don’t. There is no reason your hand shouldn’t make this motion AT ALL TIMES when you’re strumming, no matter the pattern. Because that’s the motion. Remember how I said people get lost when they start thinking about the motion? What IS different is that for any eighth note strum besides down, up, you will skip playing on certain beats. You won’t skip the motion, but instead avoid sounding the notes as you go by. Grab your ‘ukulele. Make a strumming motion on it without hitting the strings and making noise. This is done simply by moving your hand out and away from you ever so slightly. Notice what you are doing on the “+” of each beat. Unless you have two hands on your right arm (you’d be the envy of the uke world), you’re ghost strumming up on the “+” without sounding the strings. Now let’s try the classic DDUUD strum. It often trips people up the first time they try it. The ones who get it easily are the ones who retain the steady eighth motion. I invite you to check out Ukulele Go’s page on 32 strumming patterns if you haven’t already. They are all eighth note strums which is perfect practice for this. Play through each one. And instead of thinking of a new motion, simply keep steady eighths going the whole time and change which strums you skip. 99% of songs can be broken down into even eighth note chunks. That means, while perhaps not very musical, an eighth note strum should fit most songs. Some will be straight eighths, some will be swing eighths. Doesn’t matter. Listen to the song and play along with your eighth strum motion (if you don’t know the chords, mute the strings). It probably won’t sound very good. If you have trouble finding the beat, read up on timing. As you play, listen for the strong beats of the song – places with more emphasis than others. This is likely a place to keep a strum. Try to decide on a scale of one to five the importance of each count and its eighth note. If you want to write it out – go ahead. This will become an instant assessment in the future, but sometimes it helps to do things the long way first. Get rid of as many low-number strums as you feel is appropriate. This creates syncopation and sway and will sound a million times better than plain eighths. There are always many variations possible on any song. The more comfortable with this idea you get, the more you will find.